Beautiful Japanese design in homewares and fabrics has taken the world by storm in the last few years but if you’ve wanted to emulate that gorgeous style in clothing for your kids, it’s been a bit more difficult. Firstly, you need to be able to sew and secondly, you need to be so good that it doesn’t bother you that most pattern books are written exclusively in Japanese. Even for a person like me who loves the look of most things Japanese, this put the whole endeavour in the too-hard basket. Until now. US-based girls’ clothing line Noko has answered the call for beautiful girlswear inspired by the traditions and designs of Japan. 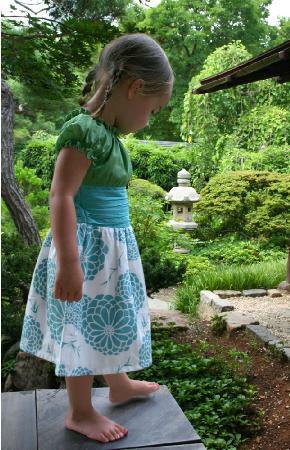 The lovely dresses, jackets and headbands in the spring collection are designed for little girls from birth to size six and are inspired by the traditional handpainted Japanese fabric tenugui, with its hundreds of uses in all levels of Japanese society. You’ll recognise the influence of Japanese kimonos and other traditional clothing in the pieces but with a modern twist. The clothing line has only been around for a few years but has taken the children’s market in the US by storm and even boasts child style guru Suri Cruise as a devotee! Despite the delicate look of many pieces, it’s all machine washable, which is what every parent wants to hear! Headbands are priced from US$20, jackets from US$30 and dresses begin at about US$78. You can pick them up from online shop PumpkinHead Kids.